Still demonstrating more potential than actual progress, Romanian band Descend Into Despair's latest album teases rather than delivers. 'Synaptic Veil' is my first brush with Romanian Doom act Descend Into Despair, which is their second full-length release. Most of the Internet seems inclined to dub them a "Funeral Doom" band but my view is that they're sometimes too up-tempo to be listed solely as a Funeral Doom act. Personally, I'd classify them as more of a hybrid between a Funeral Doom and a Death/Doom band than anything, and I'm more inclined toward the latter than the former. The first thing that struck me about this album was how clean and polished it sounded. I always find that to be quite the bold approach because it really doesn't leave anywhere for the band to hide. If the music still doesn't work after such extensive production, any failing solely lies with the band themselves for poor songwriting. With the above in mind, I'm in two minds about this album. There are some things that the Romanians do really well, and some things that they don't do well. I can't say that I had any issues with their musicianship nor their production. 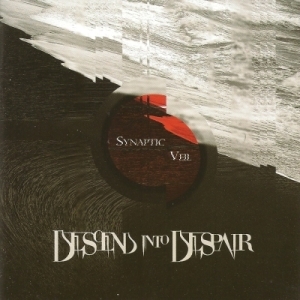 Indeed, 'Synaptic Veil' has to be one of the cleanest-sounding Doom releases I've heard for some time. However, the flip side of that coin is that they've got to produce some masterful music to make such work and frankly, they don't. History has taught us that it takes a very specific combination to make a clean-sounding Death/Doom release work (e.g. Mourning Beloveth, My Dying Bride) and Descend Into Despair do not have that combination right now. Now, I may be a touch old-fashioned when it comes to how I like my Death/Doom to be, but in my opinion, it's got to either be harsh vocals with a rawer mix or clean vocals with a clean mix. However, on this album, Descend Into Despair have used a clean mix with harsh vocals and that doesn't sound good to me. I tend to associate harsh vocals with a more intense feeling place but everything else about this album is a polar opposite of intensity; it's more contemplative than anything. I wish I could say that the above paragraph was indicative of my only fault with the music but sadly, that proved not to be the case. Individually speaking, the musicianship of the band seems absolutely fine to me. However, collectively speaking, I find it hard to understand what the band has done on each track. Each song on this release lacks direction, which is a real problem. It's as if they don't actually go anywhere, if that makes sense. If I had to guess, I'd say that they've meshed a lot of good elements from successful bands of the past without any real knowledge of what works with what. The best word I can use to describe their musical offering is "disjointed". It's not bad, and I've definitely heard worse, but it's not enjoyable either because I can't associate any kind of mood with these directionless tracks and thus I doubt I'd ever be in the frame of mind to listen to the album again. It's supposed to be contemplative - or at least that's my assumption - but it's not, which basically makes it redundant. Outside of the music itself I have one or two niggles to mention. One is that I'm not blown away by their English skills. I understand that it's not their first language but if they're going to write songs in English then they'll have to expect to be reviewed by English-speaking people. For what it's worth, I've definitely seen bands with a much weaker grasp of the language than Descend Into Despair but I found their lyrics just a touch too cringey, if I am being blunt, and my interpretation of that is that they don't have a terrific understanding of the language. I don't mind bands rolling with "romantic" lyrics or anything of that nature as long as it's done well but speaking as somebody that has written poetry for half of his life, the lyrics they've opted for on this album are too forced, particularly the rhyming structure. It shouldn't matter all that match, considering that the vocals on this release are predominantly harsh, but it does matter because to me, it cheapens what is clearly supposed to be an emotional piece of music. The terms "cheap" and "emotional" definitely do not make good bedfellows, either. The second issue I found was the inlay artwork. I liked what I saw to begin with but then noticed that the band had done something to their beach shots, presumably on purpose, which made it look a bit like an MS Paint fail. It's nothing that none of us haven't done before, accidentally "stretching" a box so all the pixels look bizarre, but the band appear to have done that deliberately on the inlay, which doesn't do anything for me. Cards on the table - I've ripped releases apart that were on a similar plateau to 'Synaptic Veil' because they were poorly-produced, poorly-structured, and badly executed. I've not been anywhere near as harsh in this review because I can see the potential of the band to succeed. For example, their harsh vocals are really strong, their musicianship is good, their production is excellent, and even the album inlay is fairly good. They really haven't made many mistakes here, Descend Into Despair - it's just that the ones they have made are particularly important, and thus damage the release considerably. I cannot recommend this release to anybody but I would recommend keeping the band in mind for future reference because, with the right co-ordination, they've got the potential to release something that's really, really good. Visit the Descend Into Despair bandpage.